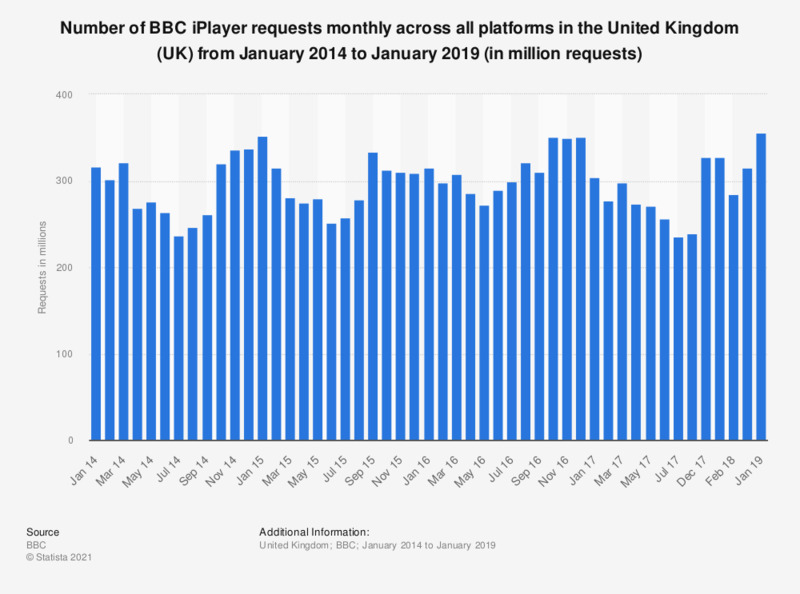 This statistic represents the number of BBC iPlayer requests monthly across all platforms in the United Kingdom from January 2014 to March 2018. In March 2018, 315 million requests were made. - Unless specified otherwise, figures include requests for both on-demand catch-up (streams and downloads), or views of live simulcasts. We cannot report download playback due to data privacy restrictions. - All data is for the UK only and excludes listening outside the UK. - This data includes requests via BBC iPlayer on any BBC website - whether on a programme, channel or station page, via the pop-out console, or on the BBC iPlayer website itself. - This report does not include requests for web-only content (such as online news or sport coverage) - only requests for full-length programmes which have been transmitted on a TV channel or radio station. - BBC iPlayer stats measurement was under-representing radio data up to mid-January 2013, when a problem was corrected. Which of the following on-demand TV services are you familiar with?